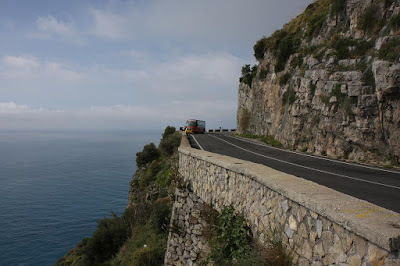 "snaking round impossibly tight curves, over deep ravines and through tunnels gouged out of sheer rock...a severe test of driving skill and courage, a white-knuckle ride...the price for those sublime views is numerous switchbacks and plunging drops to the sea, frequently with only waist-high barriers between you and oblivion." 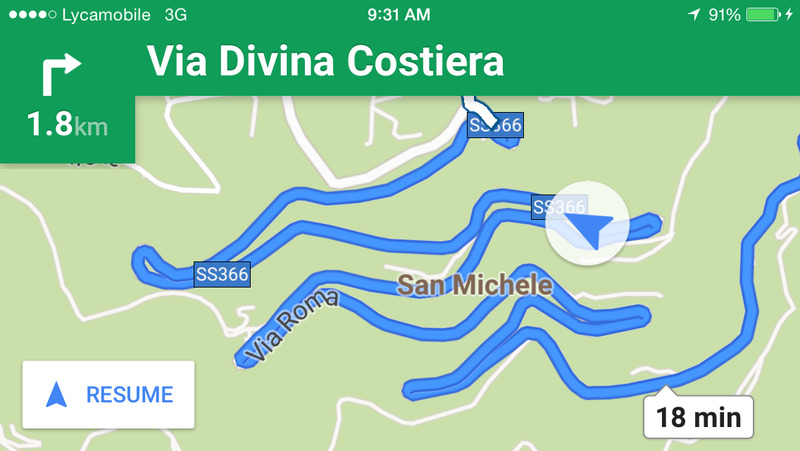 One of our big splurges for the trip was a guided hike on Sentiero Degli Dei (Path of the Gods)--supposedly the most beautiful hike in all Italy. 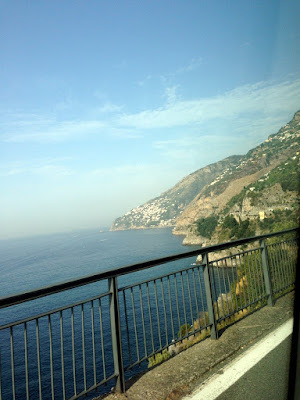 We made arrangements with a private guide, Gabriella of Walk Positano, to take us from the trailhead in Bomerano down to Positano on the coast. 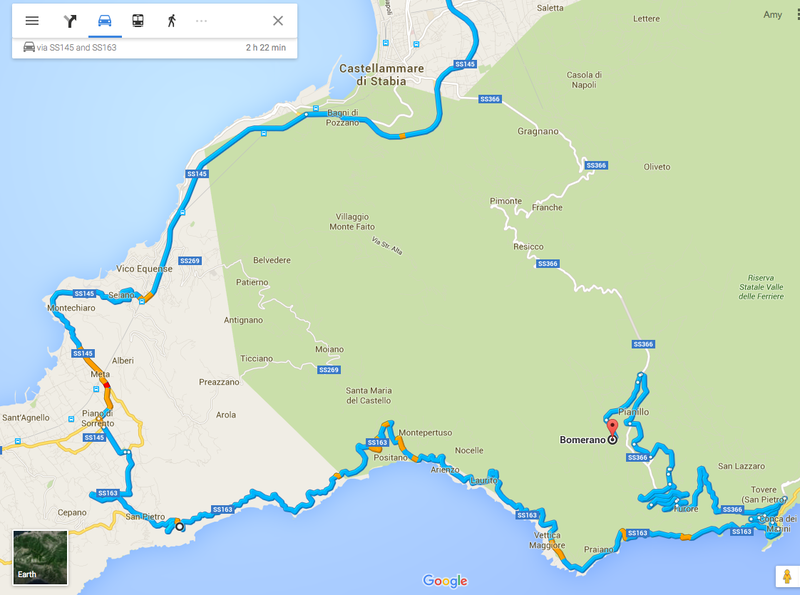 The only way to get from our B&B in Portici to Bomerano was to hire a taxi. 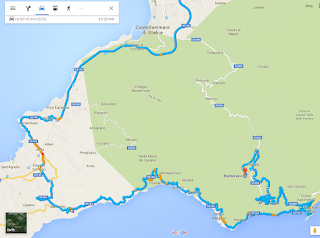 Preliminary research indicated that a ride should cost around 40€ - 50€ and take 45-50 minutes. 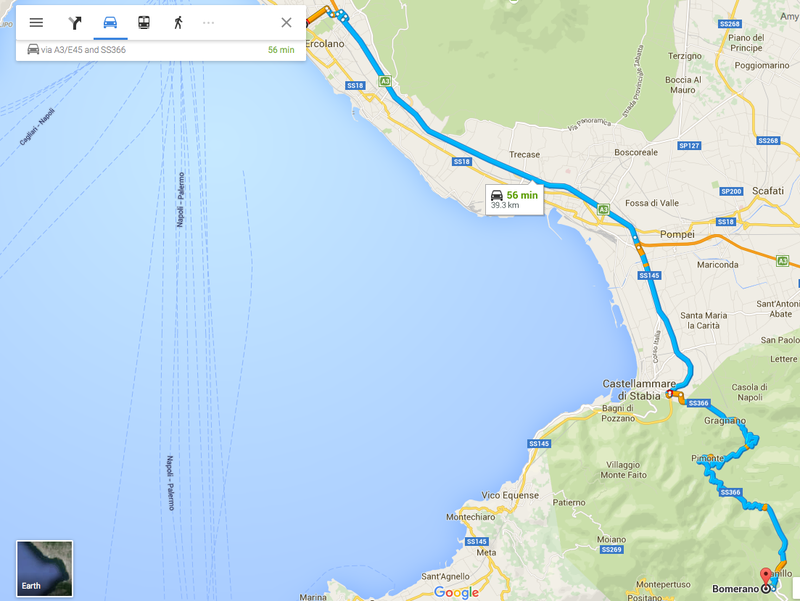 So the day before our hike, I asked our host for help getting a taxi. She clearly was not familiar with Bomerano at all...which was, in hindsight, Giant Red Flag Number One. But I gave her the name and address of the hotel where were supposed to meet our guide, told her we wanted to leave at 8:00 the next morning, and then she disappeared. When we returned that night after a day of sightseeing, our kind host had waited up to tell us that the taxi would cost 100€ - 150€. Um. WHAT? We'll call that Giant Red Flag Number Two. With the language barrier, I couldn't have much of a conversation with her about it, but we didn't really have a choice. We had to get to Bomerano; we'd already reserved the hike with Gabriella--so we'd just have to wince and pay the outrageous taxi fare. We were frustrated, but I saved a screenshot of the website where I'd found lower estimates, hoping we could show the driver and bargain. The taxi showed up promptly at 7:30 the next morning (we'd asked for an extra half hour just to be safe). The driver spoke no English. I offered him a paper on which I'd written the hotel name and address, but he waved it aside, showing me the paper our host had given him with the address. At the bottom, she had written: "BOMERANO SOPRA PRAIANO." Bomerano--above Praiano. (Red Flag Number Three.) 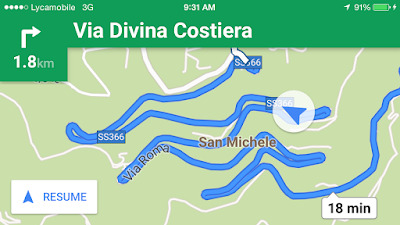 The driver typed something into his GPS, and off we went. The first leg of the trip went smoothly; I followed along on my phone with Google Maps, and we took the expected route. But then he turned off the highway and headed toward the coast. 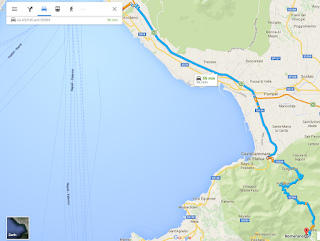 We waited, uncertain, but as we passed Castellammare di Stabia, Google Maps wasn't rerouting; it was telling us to turn around. Finally I leaned over the seat and tried to show him my phone--but again, he didn't speak English, and he waved me off. I believe he may have said something about Praiano. How many red flags are we up to now, four? The farther we went, the more nervous we got. I texted Gabriella to tell her that the driver was taking us around the coast and I feared we would be late. Yet his GPS still showed we would be there at 8:45, so we had no idea what was going on. In hindsight, we definitely should have insisted that he pull over and clarified exactly where he was going and what our map said. But you know what they say about hindsight. In reality, we were in a foreign country; we did not know the language or the area. And he was using a GPS, for crying out loud! He had the exact address, so we should be good, right? The one and only photo I got of the Amalfi Coast drive. We had wanted to experience this drive--but not on these terms! We were so stressed out about making it to our meeting point and how much the taxi was going to cost that we couldn't even enjoy the views. I handed the phone to the driver and he began a heated conversation, none of which we understood--until all of a sudden he said, "Mamma mia, mamma mia." At that point Steve and I lost it. That part needed no translation! Clearly he knew now just how badly he had screwed up. We could not stop giggling. The driver handed the phone back, and Gabriella said, "I told him he's an idiot!" She was furious with him--she couldn't understand how he (or our host) had gotten us so very lost. Now, not only were we still over an hour away, but because of a forest fire in the area, we might not be able to get through at all. She gave the driver alternate directions, but not trusting him, texted the landmarks to us as well--and from that point we navigated from the backseat. Her directions were perfect, thankfully, and she graciously told us she would wait for us. The road was jammed and only one lane, with traffic trying to go both ways; at one point our driver had to throw it in reverse so someone else could make it around the hairpin turn. Miraculously, we finally made it to Hotel Gentile in Bomerano, where Gabriella greeted us--"only" an hour late. Then it was time to pay the driver--who, it's safe to say, was having a pretty bad day. The meter showed over 200€, but we felt 100€ would be fair, given that it should have only cost about half that if he had gone the right way. He was not satisfied with that at all. "Cento cinquante!" he insisted. One hundred fifty! I knew only enough Italian to understand the number--not enough to argue. Awkwardness ensued; Gabriella translated just a bit, then turned aside, unwilling to get in the middle of the dispute. Maybe we should have just left the 100€ and walked away, but the fact was, we *had* been quoted the 150€ amount the night before, so we were on shaky ground arguing with him. Gabriella insisted we should require our host to reimburse us for part of the cost, but with the language difficulties, we decided not to pursue it. In the end we cut our losses and reassured ourselves we'd laugh at the story later. And we did. But oh my goodness, what an ordeal. Gabriella could not stop talking about it the rest of the morning--she kept expressing how outrageous she thought it was that our host and the driver could have gotten it so wrong, and she told everyone we passed on the trail (in Italian, but I could pick out enough familiar words to know she was repeating the story again). So the hike cost us a whole lot more than we planned--but it gave us a memorable story, and it was indeed a spectacular hike. Pictures of that coming tomorrow!